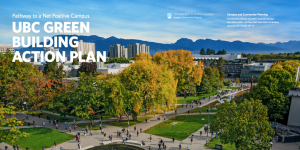 From Fall 2017-2018, I had the very exciting and unique opportunity to participate in writing and researching the new UBC Green Building Action Plan (GBAP) for UBC Campus and Community Planning. 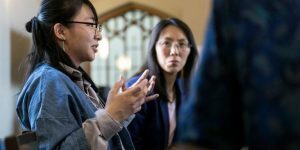 The GBAP outlines goals, targets, and actions to advance academic and residential buildings at UBC towards making net positive contributions to human and natural systems by 2035. 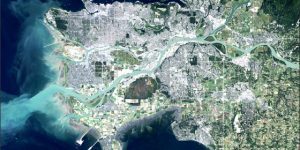 Buildings are the main anthropogenic cause of death for birds in cities, with approximately 16 to 42 million deaths in Canada each year, and around 10,000 deaths at UBC. 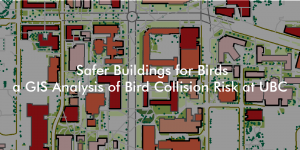 To investigate this issue as a final project in my Advanced Issues in GIS class, I created a model to identify core institutional buildings of high bird collision risk at UBC. The project aims to recommend UBC Operational staff where to target bird friendly design retrofits. This week, I have been tasked to identify and produce a report on a rare plant species, Spiranthes diluvialis, to help a hypothetical botanist with her field work in the southern Okanagan. 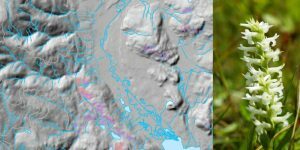 Using BC TRIM data, I create a digital elevation model and then use a multi-criteria evaluation methodology to map out ~700 hectares of potential habitat for the botanist to research. It’s been about over a year since I was first introduced to GIS, and I’m back to take GEOB 370 Advanced Issues in GIScience! 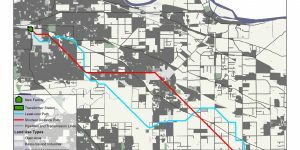 In this lab assignment, I create a least cost path analysis for a hypothetical new marijuana greenhouse in Surrey and Langley, BC. 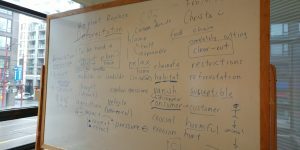 As an English Conversation Program Facilitator, I am responsible for preparing a lesson plan and guiding discussion for ESL learners on topics selected by the Program Coordinator. While I teach speaking skills, vocabulary, and pronunciation at the Learning Exchange, I'm also always learning from the patrons I meet as we exchange stories, skills, and laughs! 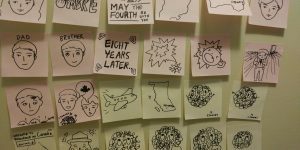 Here is a timeline of my involvement with ePortfolio making and the UBC Arts ePortfolio program starting from my 3rd year GIS class to the present! As I continue to collaborate with the UBC Arts ePortfolio program I will update this post. Vancouver Aquarium: Educating and Interpreting the Wonders of the Sea! 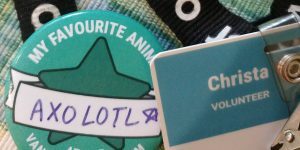 I have been a volunteer at the Vancouver Aquarium for 2 years as a Marine Educator and Gallery Educator. Find out how I engage visitors with facts and conservation takeaways about bamboo shark egg cases! 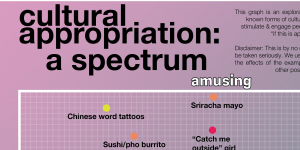 In order shed light on the complexity of cultural appropriation, I worked on a group project to present a variety of commonly discussed examples from popular media and daily life as a spectrum. Through the project, we hope to engage people to think beyond "is this appropriation?" to "if this is appropriation, who benefits and who doesn't?" 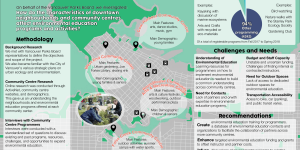 As a term-long project, I worked with a group of 4 students as consultants for the Vancouver Board of Parks and Recreation and CityStudio with the goals to: Investigate existing environmental education (EE) programming in community centres and identify opportunities for the Parks Board to expand them. Food isn't just food, it's nourishment, culture, community, and a livelihood! 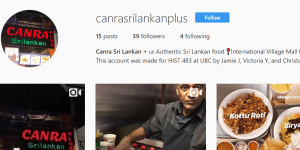 This is the idea my teammates and I had in mind when we first started this project to document and narrate the stories of Canra Sri Lankan, our favourite food court stall in the International Village Plaza mall. As the first assignment for my HIST 483 - Asian Migrations to the Americas class I was given the "simple" task of "representing a class partner in video, text, or sound". I chose to make a stop-motion draw-my-life style video! This assignment mostly gave us the chance to experiment with video-making and interviewing subjects for later assignments. For the final project of my GEOB 372- Introduction to Cartography course, we were tasked to make a thematic map on any issue we were interested in. 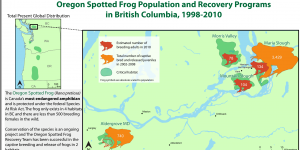 As a volunteer for educational programs at the Vancouver Aquarium I decided to use my cartography skills to make an educational proportional symbol map that would summarize the current state of Oregon Spotted Frog populations and recovery programs in BC from 1998-2010. This is a proportional symbol map of major cities in India created through ArcGIS and Adobe Illustrator. I compare two methods of proportional symbol mapping: absolute and perceptual scaling. 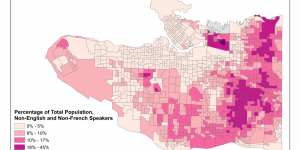 Using Canadian Census 2011 data, I create a choropleth map of non-English and non-French speakers in Vancouver on ArcGIS. 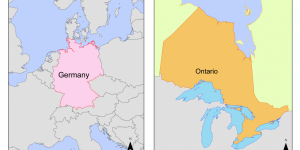 Projections are important for all cartographers to consider, and in this assignment, I design maps of Germany and Ontario on ArcGIS according to custom equal area projections. 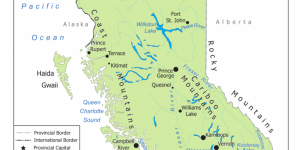 In this assignment, I create a reference map of major cities in BC with symbols with proportionate to population. As it was quite challenging to find ways to fit all text on the map, I provide some tips on text placement! 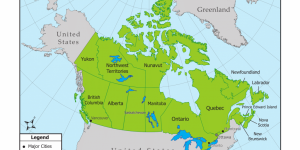 In this assignment, I was tasked to create a reference map of Canada that would be used in a high school social studies textbook. 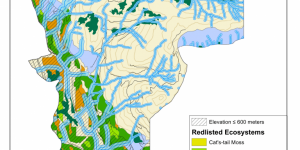 Using Adobe Illustrator, I explore different symbols to represent geographic features of Canada and create map elements such as a legend, scale bar, and north arrow. Welcome to my first cartography work! 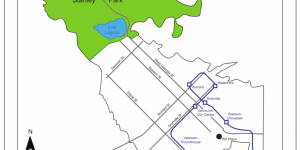 In this first week, I have been tasked with hand-drawing a special purpose map of Downtown Vancouver to familiarize myself with Adobe Illustrator. 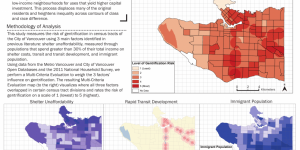 As the final project for my GEOB 270 Introduction to Geographic Information Sciences course, I work with three classmates to analyze and present a map of gentrification risk in the City of Vancouver. In this assignment, I have been tasked with performing an environmental impact assessment of the proposed Garibaldi resort in Squamish. Affordability is measured through the ratio of median house price to median income. 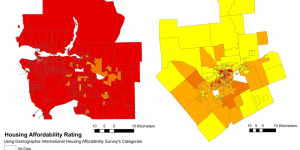 In this assignment, I explore housing affordability in Vancouver and Ottawa using Census 2011 data and create a map. 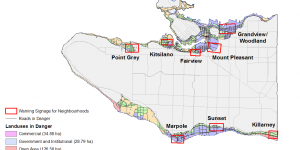 In my first week of learning GIS in my Introduction to GIS course at UBC, I have started to learn how ArcGIS works and also come across a few major concepts: Coordinate systems and Landsat data.